The ceremony of Brit Milah affords the opportunity to honor family members and friends. Below is a list of the honors that may be assigned at the bris. Please decide in advance those people whom you would like to honor. If you are involving the help of a rabbi, he/she can help you decide on specific honors. If you are using candles to enhance the spiritual mood, you may assign someone to light the candles. They are lit before the ceremony starts. No blessing is required. One to several people to bring the baby in for bris, and to hold him initially. He can be passed from person-to-person, so each has a chance to hold him. One person who sits with or places the baby in the chair or throne	of Elijah. This comes just before	the circumcision, and gives us an opportunity to welcome the spirit of the Prophet Elijah (Eliahu HaNavi) to the bris. According to tradition, Elijah was the only prophet not to have died. Instead, he rode up to shamayim (heaven) in a chariot, and returns to Earth to accomplish various chores for Hashem. It is said that Elijah returned to life as Pinchas, Aaron the Kohen Gadol's great grandson. Just as Elijah visits every Passover seder, he also attends each and every bris. He is also said to be the one who will herald the coming of the messiah. There are several reasons Elijah is said to visit every bris. He comes to safeguard the baby through the procedure. In a prayer for Elijah, recited at the bris, Elijah is referred to as "Malach HaBris", or messenger of the covenant. This is an allusion to Elijah's future role of bringing the era of redemption (the messiah). Since every Jewish baby boy has the potential to be the messiah, Elijah accompanies him at his bris. Finally, as described in the book of Kings (Chapter 19, verse 10), Elijah declares to Hashem that while he has zealously defended the honor of Hashem, some Jewish people have become lax in observing the mitzvah of bris milah. G-d replies, "By your life, henceforth Jews will perform circumcision only when you see it with your own eyes." This can be interpreted as a reward for Elijah's zealousness and concern for Jewish observance of this mitzvah, or as a punishment for complaining. The sages instituted the ritual of placing the baby on the Throne of Elijah (Keesay shel Eliahu) at his bris, so he can sit with Elijah before his circumcision. In respect for Elijah the Prophet, we follow this tradition at every bris. Holds the baby's legs still during the actual circumcision. One Jewish male. 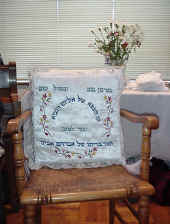 The Sandek is the highest honor, and is usually given to a grandfather, if possible. 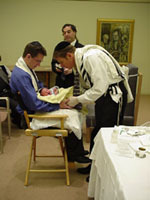 Holds the baby while the naming prayers are recited, as he receives his Hebrew name. I suggest his mother do this, so she can comfort him. Recites the "motsi" or prayer over bread at the light meal which usually follows the circumcision.